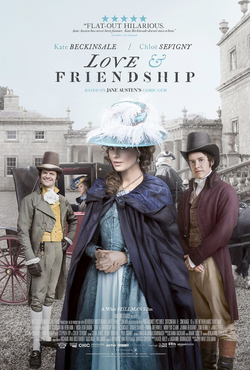 Love & Friendship is based on Lady Susan, a little-known work by Jane Austen. There was a time, not too long ago, where Austen was the most in-demand dead writer around: Sense & Sensibility, Pride & Prejudice (film and television adaptation), Emma, even Clueless (a modern retelling of Emma) were all the rage. The mad rush has died down a bit, but Whit Stillman brings this small work to life in a charming, light, amusing portrait of our anti-heroine: clever, manipulative, whom we shouldn't like but end up as bewitched as nearly every man who comes past her. Lady Susan Vernon (Kate Beckinsale) has gone to 'visit' her in-laws at a most opportune time. The recent widow has 'opted' to leave another estate after certain rumors of a dalliance with the devilishly handsome Lord Manwaring (Lochlan O'Mearain). While at her in-laws estate of Churchill, her sister-in-law Catherine (Emma Greenwell) and Catherine's brother Reginald DeCourcy (Xavier Samuel) are wary of the notorious flirt's reputation, but it isn't long before Susan has worked her charms on Reginald, convincing him that she is a wronged woman. Complicating matters is Lady Susan's daughter Frederica (Morfydd Clark), whom Mother doesn't care much for but is obligated to take care of in some way. Frederica has run away from her expensive boarding school and thus expelled, requiring her to come to Churchill too. This might be good, as Lady Susan is determined to marry Frederica off to the wealthy Sir James Martin (Tom Bennett), even if he is a total idiot (when he arrives at Churchill, he tells the astonished family he had a hard time finding it because he was looking for a church on a hill, not an estate). Frederica has no interest in Sir Martin despite his wealth, which to Lady Susan is downright scandalous. In her various machinations she has help from her American co-conspirator Mrs. Alicia Johnson (Chloe Sevigny), who stays loyal to Lady Susan despite the objections of Mr. Johnson (Stephen Fry), who constantly threatens to send her back to Connecticut should she keep working with the duplicitous Lady Susan. Reginald has fallen in love with Lady Susan despite all objection and sense, but in the various scheming Lady Susan has pretty much gotten herself into knots that leave him confused. No matter, for despite how glum thinks look, Lady Susan's wit, charm, and shrewd mind always help her land on her feet (even if she has to get on her back to do so). With a little advise from Alicia, Lady Susan herself marries Sir James, which works out well for everyone. This frees up Reginald and Frederica (whom the DeCorcey's are genuinely fond of) to marry each other. Happiest of all is Sir James himself, who informs Alicia that he is doubly happy: not only has he a new best friend in Lord Manwaring (who has been staying with him since his own marriage broke up), but is going to be a father himself...the new Lady Martin having told her new husband she got pregnant a week after the wedding. Love & Friendship is a light comedy, aided by so many factors. The first is the performances of the cast, one of the best around. Given how often Beckinsale is in such awful junk as Pearl Harbor or those Underworld movies one could be forgiven for thinking she either can't act or is just a second-tier star. Love & Friendship pretty much should silence any who think she can't deliver a fine performance as a legitimate actress. She was wonderfully droll as Lady Susan, a woman who lived by her wits and wasn't afraid of saying or thinking rather self-centered or snobbish things. She was wickedly honest about her situation of essentially living through the charity of others and working to fix that, but also not afraid to pursue her own wants. She even, in a bizarre way, had a nobility to her. Though she doesn't care much for her daughter, her motives to provide a good future for Frederica were a result of her own precarious situation and a desire not to see her daughter go through that too...even if it meant shunting her off to a total nitwit. Every time it seems Lady Susan is about to be undone, she manages to pull herself out of the fire, and it's a credit to Beckinsale that her Lady Susan doesn't come across as evil but almost endearing in her self-centeredness and shrewd ability to work a room. Who else could get away with so much and have us like her for it? Every actor did a spot-on job, even those who have smaller roles, such as Conor MacNeill as The Young Curate. He has essentially one scene, where he responds to Frederica how she should follow the Fourth Commandment. A bit puzzled, he wonders about how one should ask about keeping the Sabbath, then tells her it's the Roman tradition to make 'honor thy father and mother' the Fourth Commandment, which he (I presume, an Anglican) knows as the Fifth. He then gives a long, perhaps rambling dissertation on it that is a light, amusing moment. Samuels is appropriately Austenesque as the lovelorn Reginald, intelligent but besotted. Sevigny lends a wicked wit as Lady Susan's American accomplice, a strong partner to Beckinsale. I truly can't think of a bad performance in Love & Friendship. The best performance, however, was that of Bennett as Sir James. From the moment he comes, explaining his difficulty over 'church/hill', he steals every scene he's in. His delight at the new invention of 'peas' (which he claims to have never seen) and his puzzlement over the Twelve Commandments is comedy that's both broad and small. It's broad in that it is so outrageous, but small in that Bennett isn't over-the-top with his delivery of it. When told there are only Ten Commandments, he continues in his idiocy, wondering which two he could ignore. Bennett has a gleeful, almost manic delight in Sir James' naiveté and cluelessness, making him less a figure of fun and more a man-child (the scene where he is dancing with others is a delight). It's a delightfully balanced performance, and I think a credit to him and to Stillman as a director. Stillman kept things going smoothly, showing that this was a comedy down to how our characters were introduced. His adaptation of Lady Susan is full of wit, showing a dexterity with words that make our characters smart, or at least well-spoken (well, except for Sir James). A final point I'd make is on Benjamin Esdraffo's score. The music appears to be highly influenced by Handel, and I've no objection to the light, delightful score. I think 'delightful' is the term I'd use for Love & Friendship. I won't begrudge that it might feel a bit slow for some (a flaw in some costume pictures), but on the whole, with strong performances by the cast en masse (particularly by Beckinsale and Bennett, shamefully overlooked on Oscar time), a witty script by Whit Stillman, it is a nice film for a quiet Sunday afternoon.